The Nokia Ringtone is unquestionably the most well known ringtone in the WORLD. Even with the state Nokia it’s in now, the Nokia tune is still world known, changing from the melodic beep, to polyphonic, to mp3 piano versions (wasn’t there a guitar one too?). You’ll also hear it often in public because Nokia seems to be one of the few brands remaining where people still make phone calls :p. Nokia tunes are sometimes so popular, in films you’ll hear non-Nokia phones sound like them (either SMS or in call). Check out Conan O’Brien’s Nokia Ringtone song in devotion to Finland. Nokia Conversations is asking you guys to create the next Nokia Ringtone for a select new bunch of Nokia Phones coming out in 2012. (They better still have the original Nokia tune!). Nokia says this means your winning entry could be on some 100 Million devices. This tells you exactly what type of devices those are, huh? There’s 10,000USD up for grabs for the winning tune. Update: Oh here’s a video as noted by kunwar. 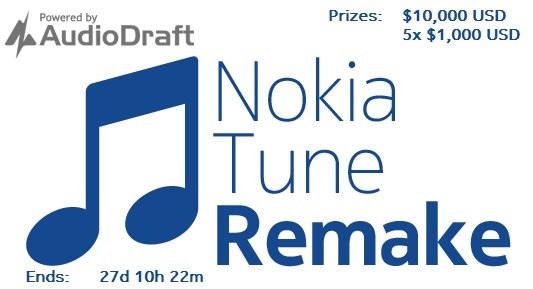 To enter, you have to register yourself at nokiatune.audiodraft.com to submit your tune. You can also cast your vote for your favourite tune. Deadline is October 2, 2011 which the countdown says is about 27 days away. Nokia Tune is one of world’s most recognized audio brand assets and is estimated to be heard over one billion times a day. Nokia is launching a global crowdsourcing campaign to find a fresh version of the Nokia Tune. This is the first time Nokia is inviting people to work with the iconic tune with the winning tune to be placed next to the standard Nokia Tune in a selection of the company 2012 product portfolio. The tune should be fresh, expressive, original, creative yet distinctively a Nokia Tune. All collaborations are welcome. Learn more. But that doesn’t matter as I’m not the one judging. The five top voted entries are immediately finalists. A panel of judges picks 5 more people and then make the deciding vote on the top prize ringtone that receives $10,000. 5 runner ups will also have their ringtone published to Ovi Store, and for this, they get $1000 each. Tommi Koskinen is the Community Manager at AudioDraft. Thanks Bas and mrprince for the tip!